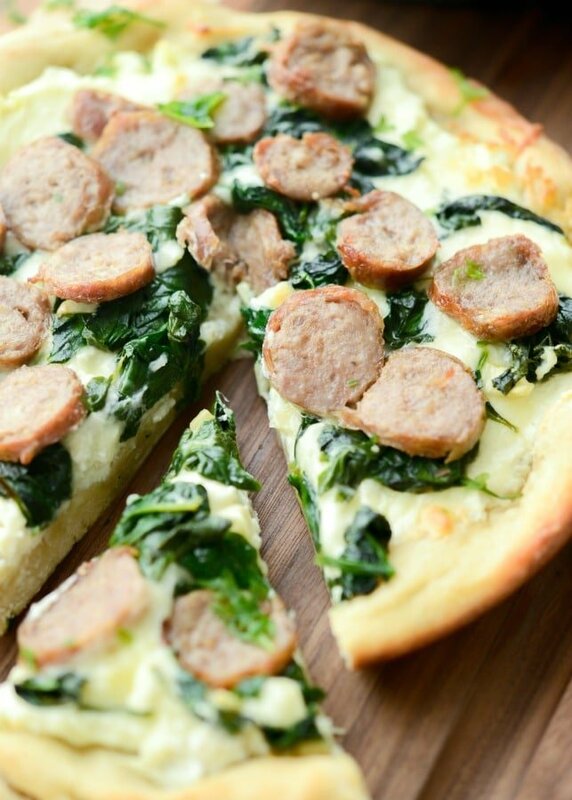 Sausage & Spinach White Deep Dish Pizza made with part skim Ricotta and Mozzarella cheeses, fresh spinach, garlic and sweet Italian sausage. 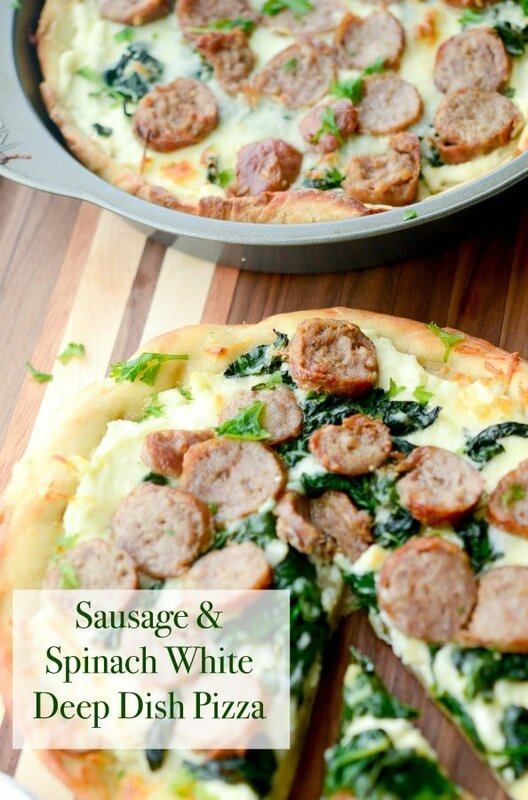 Last week when I made Italian Stuffed Spaghetti Squash and added sausage, I did so because I made this recipe for Sausage & Spinach White Deep Dish Pizza had some extra links that I didn’t want to go to waste. 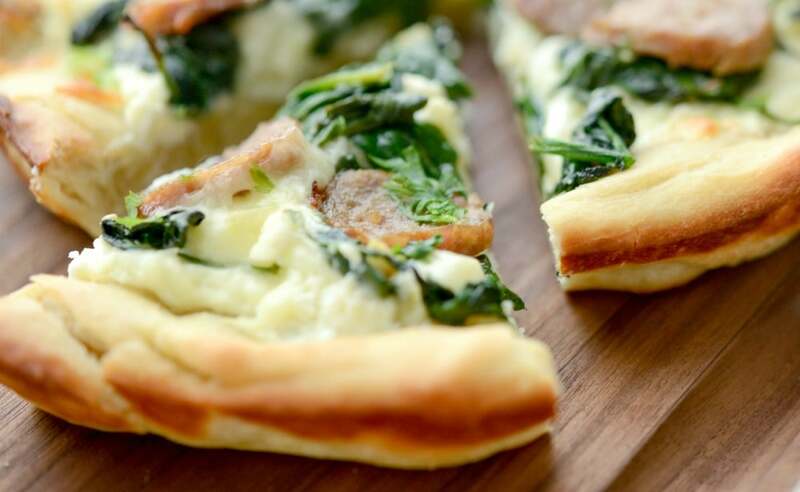 I’ve made and shared several pizza recipes before, but never this combination. Mainly because it’s usually the type of pizza we order out from our local pizza place when we’re in the mood for that thin crust, New Jersey/New York style pizza and I don’t feel like cooking. Yes, I get that way too, trust me! 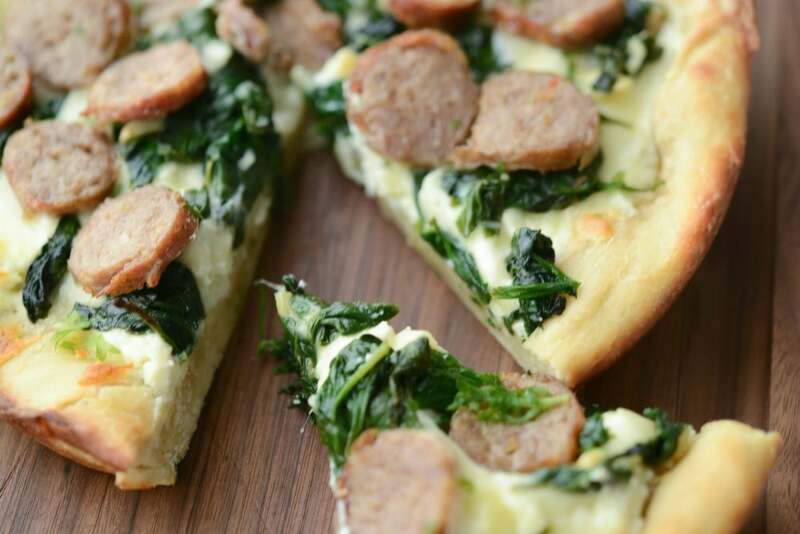 So whenever we do decide to order pizza out, we get two round, thin pies: plain cheese and sausage & spinach white pizza. This way we have extra slices to freeze for last minute weekend lunches or weeknight dinners when we’re all off and running in different directions. The white pizza is one of our favorites and allows us to enjoy pizza without the red sauce; which can sometimes upset our stomaches. Even when I make pizza at home, I usually forgo the sauce and make it Margherita style with fresh tomatoes, basil and cheese instead as my family prefers it that way anyway. This time, since I was making one of our favorites at home, I decided to make it deep dish style to change it up a bit. For this recipe you’ll need 2 lbs. of pizza dough, cooked and sliced Italian sausage (I used sweet), fresh baby spinach, garlic, EVOO, Ricotta and shredded Mozzarella cheeses (I used part skim for both) and two cake pans. I use a frozen pizza dough made by House of Pasta as it’s made in NJ and defrost it; however, you can make your own or buy it fresh from your grocers refrigerated section or even your local pizza place. For the sausage, you can use the links and bake them in the oven or use ground sausage. 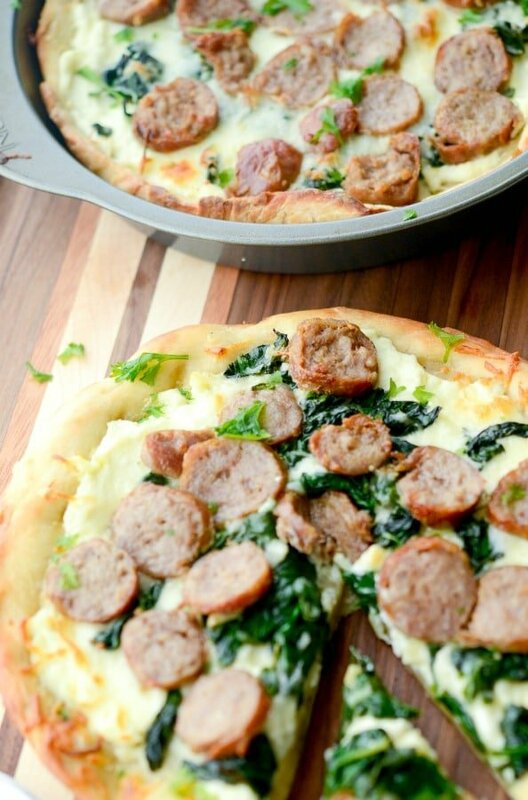 As long as the sausage is cooked through and no longer pink before you add it as a topping to your pizza. This can be done ahead of time and refrigerated up to 3 days until you’re ready to use. Start by preheating your oven to 425 degrees F; then generously grease two 8-inch (or 9-inch) cake pans with extra virgin olive oil. Mine had 1 1/2″ sides so if your pan has 2″ sides, the crust may be a little thinner. Add 1 lb. of the dough to the pan and stretch it out on the bottom and up the sides of the pan. It may take a few minutes to do this as the dough will keep shrinking back down the sides, but stick with it, it will stay eventually. Repeat with the second pan. 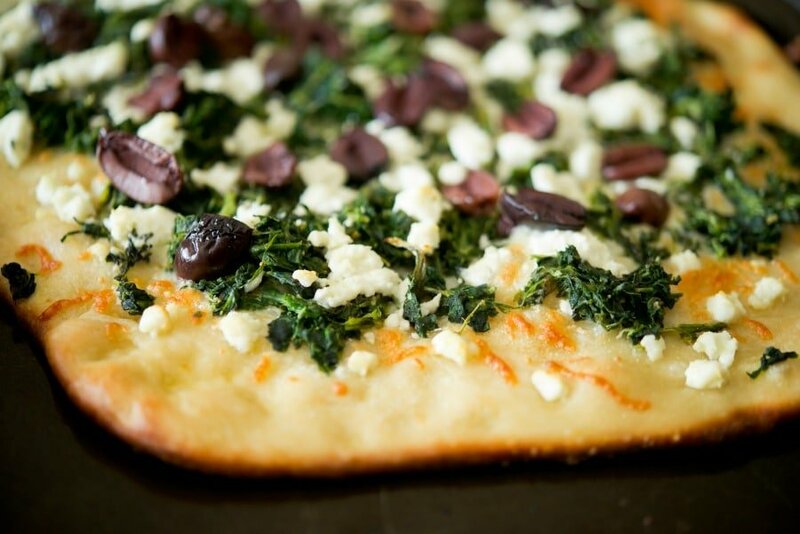 Add a little more olive oil to the top of the dough, place both pans in the oven for 10 minutes to par bake the crust; then remove the pans from the oven. While the dough is par cooking, heat a little olive oil in a large pan, add the garlic and spinach and saute until the spinach has wilted. 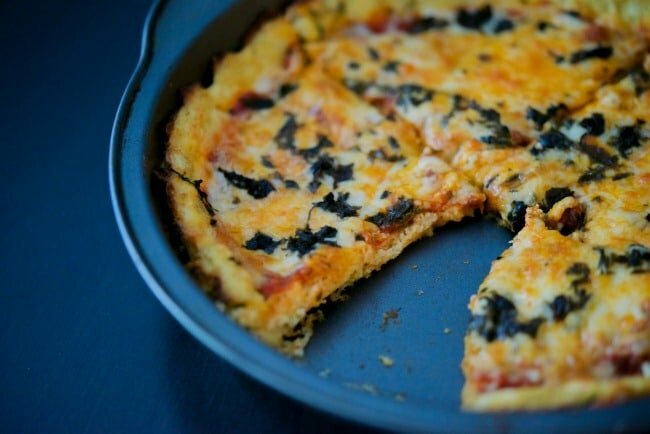 Now it’s time to assemble your deep dish pizza. 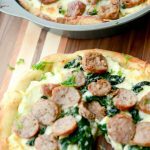 Spread a thin layer of the Ricotta cheese on top of the dough, then add the Mozzarella cheese, spinach and garlic mixture and the sausage. Finally, place the pizza back in the oven for another 10-15 minutes until the crust is golden brown and the cheese has melted; then cut the pizza into wedges. I got eight wedges per pizza, served it with a tossed salad and one to two slices were plenty for dinner because of the denser crust. 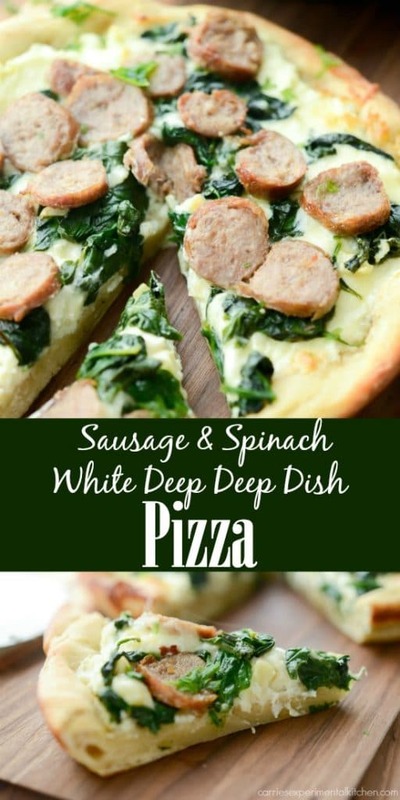 This Sausage & Spinach White Deep Dish Pizza was amazing and my family really enjoyed it. Now I don’t know whether I prefer the thick or thin crust variety better. ~Enjoy! Repeat with the second pan. Add a little more olive oil to the top of the dough, place both pans in the oven for 10 minutes to par bake the crust; then remove the pans from the oven. While the dough is par cooking, heat a little olive oil in a large pan, add the garlic and spinach and saute until the spinach has wilted. 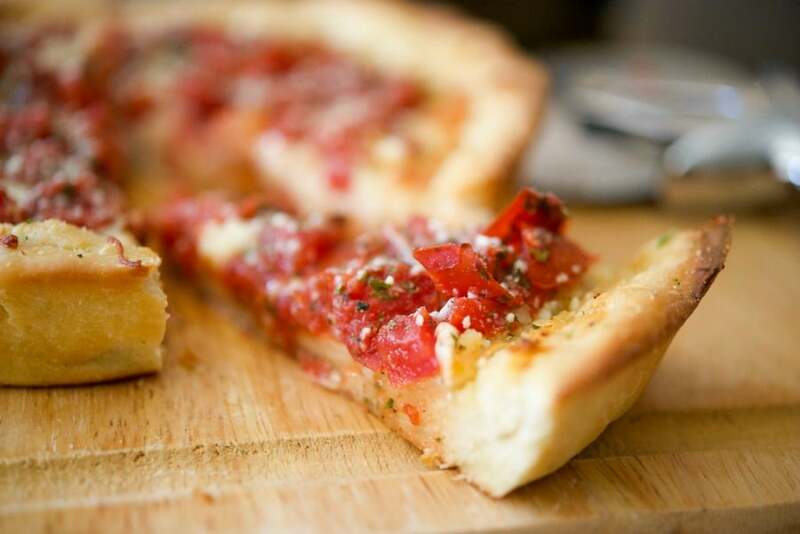 Remove from the oven to add your toppings. 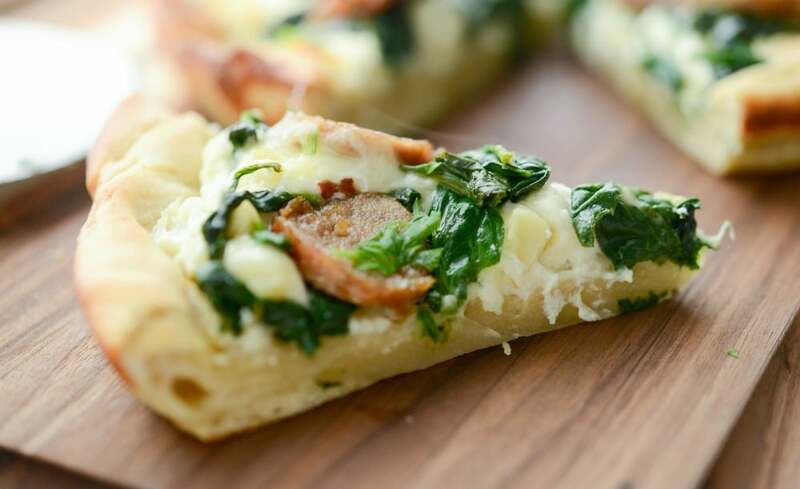 Spread a thin layer of the Ricotta cheese on top of the dough; then add the Mozzarella cheese, spinach and garlic mixture and the cooked sausage. Finally, place the pizza back in the oven for another 10-15 minutes until the crust is golden brown and the cheese has melted; then cut each pizza into eight wedges. 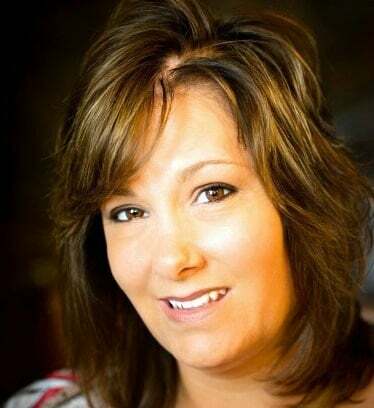 *You can substitute ground sausage for the links and whole milk cheeses for the part skim. 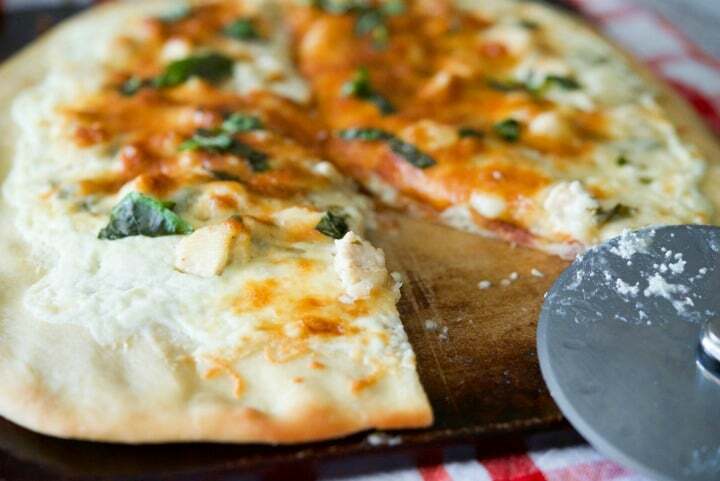 For more pizza and flatbread recipes, visit the Recipe Index or my Pinterest board!